We provide the lakes and mountain region surrounding Tamworth NH with wholesome, sustainable and tasty bread. 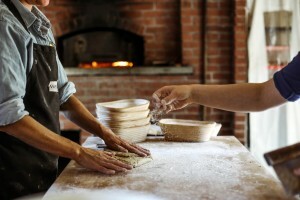 We mix by hand using regional flour and house-milled grain, rise our loaves slowly with sourdough, and bake them on the hearth of our wood-fired brick oven. If you would like to see a video about our bakery, go here.